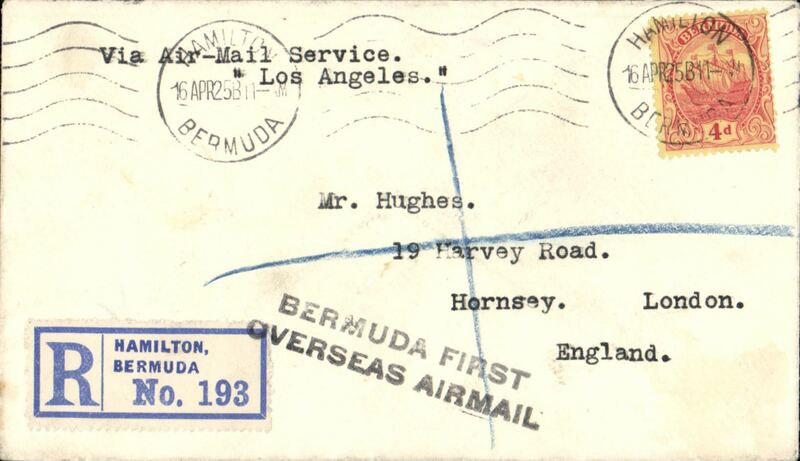 Airship 'Los Angeles', F/F Hamilton to New York, bs 24/4, registered (label) cover franked 4d canc Hamilton/Bermuda cds, black two line "Bermuda First/Overseas Airmail" and typed 'Via Air Mail Service/Los Angeles. cat 250 USD, Clark WJ, 1990. 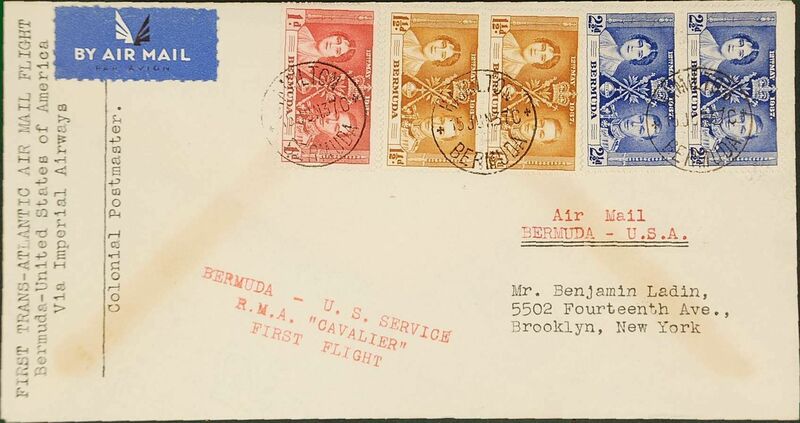 Imperial Airways, F/F Hamilton to New York, no arrival ds, red " Bermuda to US Service RMA Cavalier First Flight" cachet. 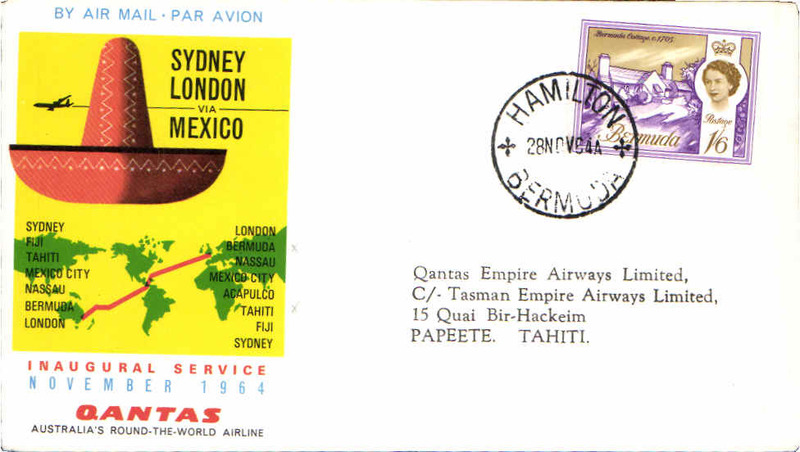 Pan Am F/F FAM 17, inward to Hamilton, (from Baltimore US), bs 18/3 , b/s, large violet flight cachet, air cover. 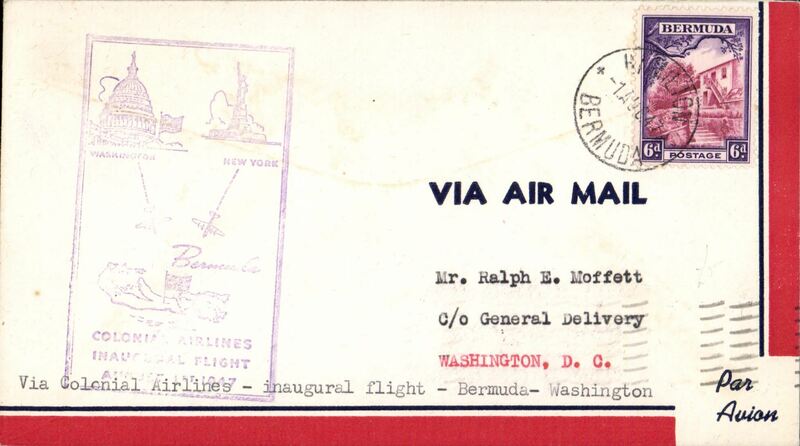 Pan Am F/F Bermuda to Port Washington, airmail cover franked 9d, canc Hamilton cds, red two line "First Flight - Bermuda/ to Port Washington, NY". Marked the change of the terminal northward from Baltimore to the New York area. Uncmmon and not easy to find. Bermuda first acceptance to England for carriage on the Pan American Southern Route, bs "Delivered and Guaranteed Genuine/J. 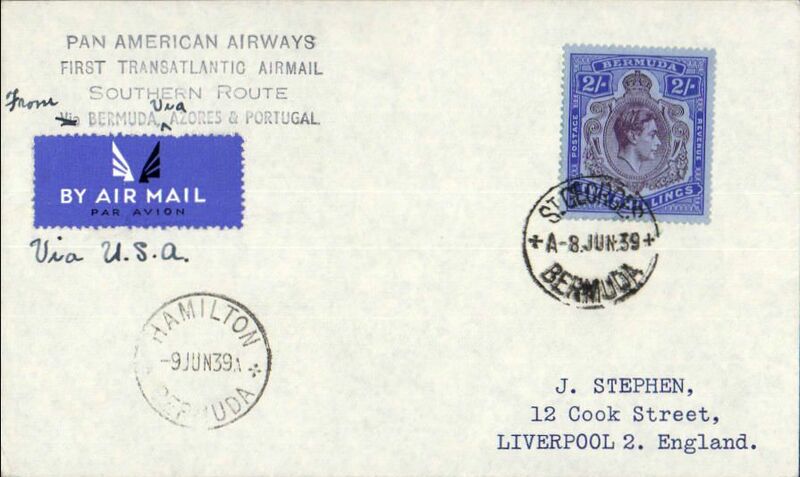 Stephen/Liverpool/14 Jun 1939", airmail etiquette cover franked 2/- KG VI keyplate stamp, canc St Georges/8 Jun 29 and Hamilton 9 Jun 39, four line "Pan American Airways/First Transatlantic Airmail/Southern Route/from ms 'Bermuda' ms 'via' Azores and Portugal" cachet, ms 'Via USA'. 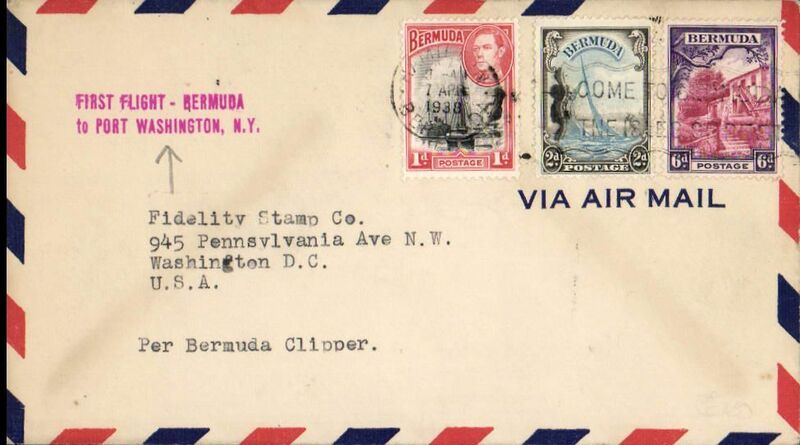 Mail from Bermuda was accepted for the third trans-Atlantic service on this route which had been inaugurated on 20 May. 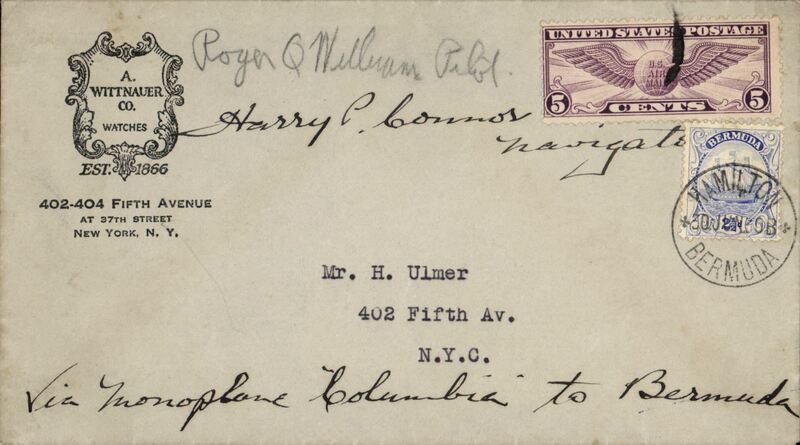 Scarce, but covers franked with the keyplate stamp are even scarcer. Very rare Bermuda first acceptance to England for carriage on the Imperial Airways Northern Route, bs "Delivered and Guaranteed Genuine/J. 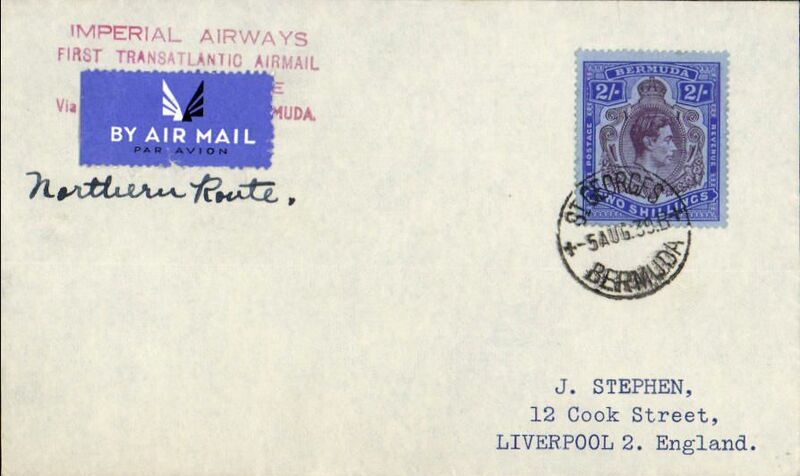 Stephen/Liverpool/12 Jul 1939"(date error, should be 12 Aug), airmail etiquette cover franked 2/- KG VI keyplate stamp, canc St Georges/5 Aug 39, red four line "Imperial Airways/First Transatlantic Airmail/**********/Via *******muda". 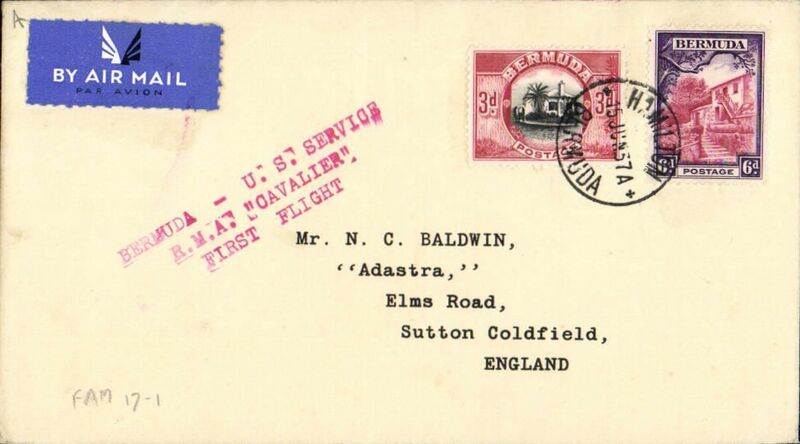 A blue/white bilingual airmail etiquette has been placed so as to cover the third and fourth lines of the cachet and a ms 'Northern Route' written instead. 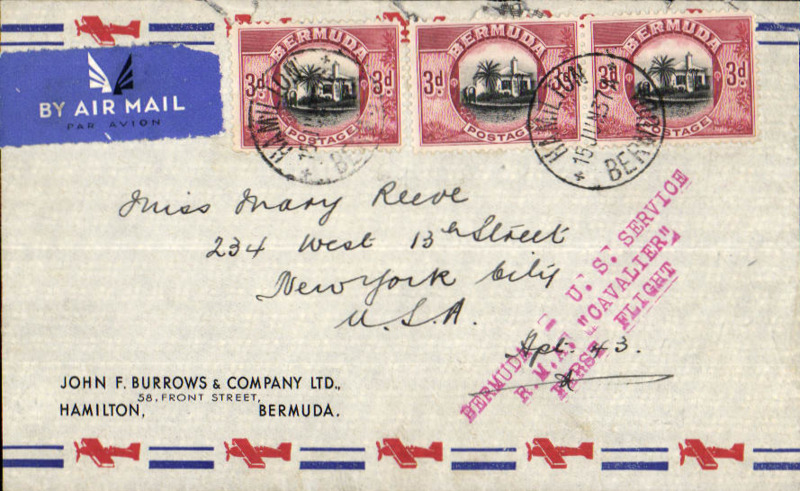 A few covers were sent from Bermuda via New York to England. This important dispatch was catalogued for the first time in 1990, when W.J. 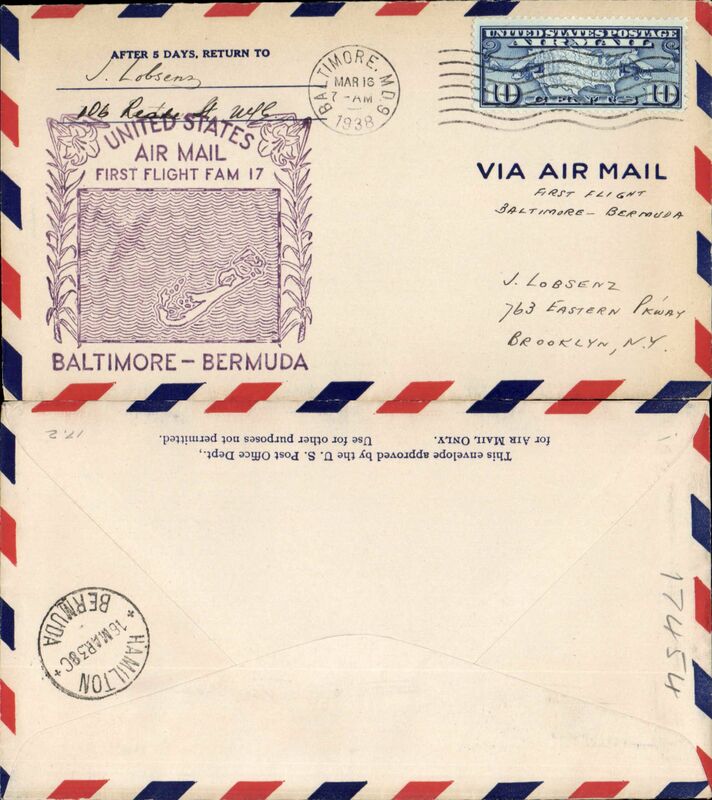 Clarke reported in his Airmails of Bermuda that he only knew of TWO such covers. 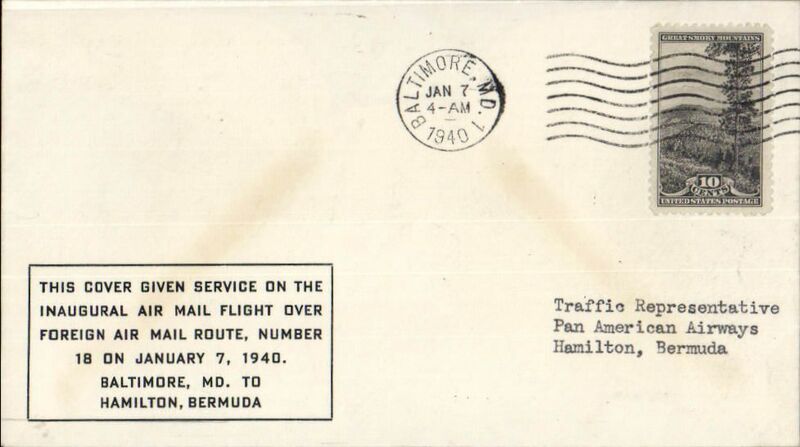 F/F FAM 18, into Hamilton from Baltimore, no b/s, black boxed cachet "This Cover Given Service on the Inaugural Air Mail Flight over Foreign Air Mail Route, Number 18 on January 7, 1940, Baltimore, MD, to Hamilton, Bermuda". This was the first flight from Baltimore to Bermuda following Pan Am's decision to close New York and move its winter base South during the heavy winter of 1940. Scarce cachet. Colonial Airlines. first Scheduled Flight Hamilton to Washington, bs 1/8, violet rectangular cachet. Image. 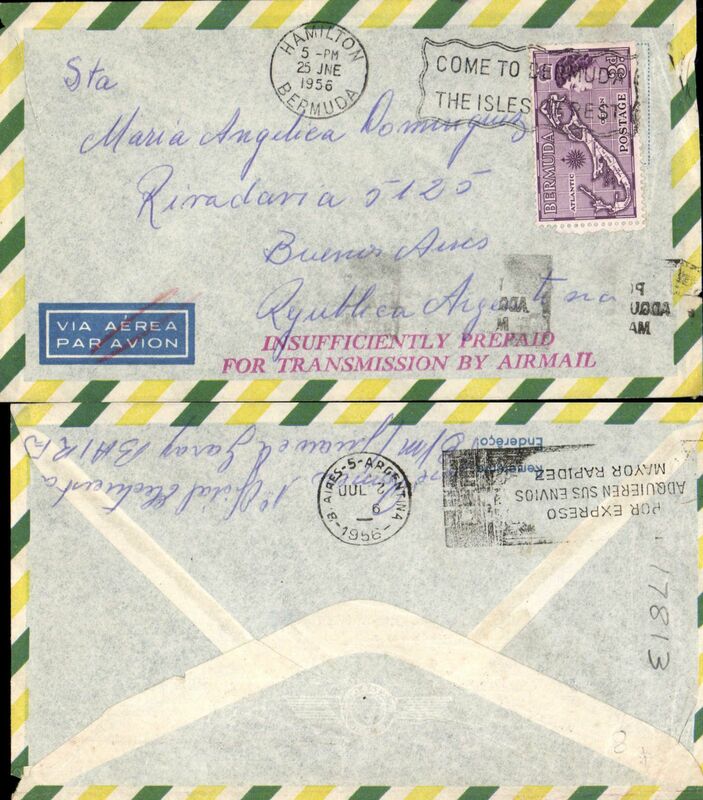 Hamilton to Buenos Aires, bs 2/7, yellow/green/white bordered airmail cover franked 3d, airmail etiquette cancelled by red double line, and fine strike red "Insufficiently Prepaid/For Transmission By Airmail" hs. 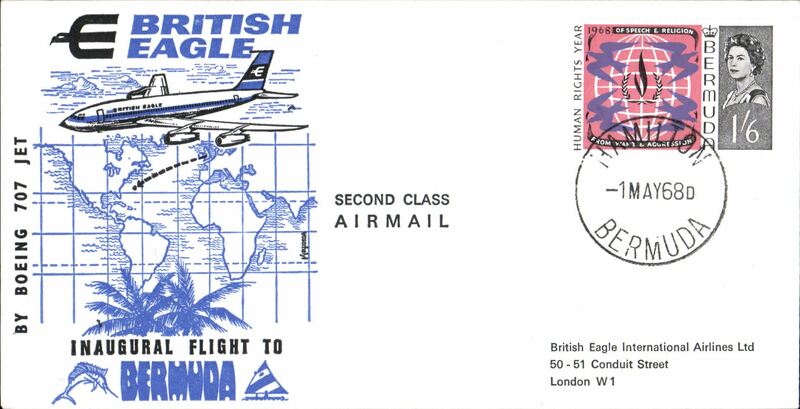 British Eagle F/F Boeing 707 Hamilton to London, bs 4/5, souvenir cover franked 1/6d. Image.